Lets start GREEN FRIDAY. Instead of tossing out old crap, trade it in so someone else can use it. Trade in old gadgets, phones, video games, tablets and computers with the Amazon’s trade-in program. America tosses out 143,000 computers a day. 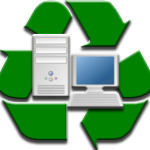 The majority of these 143,000 computers are not recycled, and pile up in landfills.